Andalucia is the ideal place for those looking to enjoy a spot of hiking since it boasts a vast number of diverse trails. Here you can experience not only a variety of landscapes such as the highest mountains on the Iberian peninsula but also the network of paths and green routes. Observe the most exotic birds migrating from Europe to Africa and experience the fascinating and unique culture first hand. It really is best seen on foot and none more so than Benalmadena and the province of Malaga. During your holiday in Benalmadena you will be able to enjoy a plethora of charming boutiques, picturesque beaches and enticing places to eat, however for those looking for something a little more active then follow our guide and see another side of Malaga with MAC Hotels. 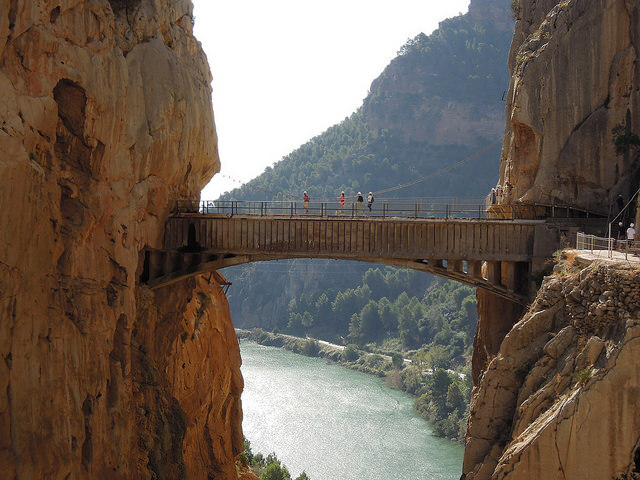 There seemed no better place to start than with one of the best known hiking routes in Europe: The Caminito del Rey, known as one of the world’s scariest hikes thanks to its dizzying heights of up to 105 metres, panoramic views and 7.7 km of narrow pathways but it is also a truly unmissable attraction when looking at things to do in Malaga. Located north of Benalmadena, this route is not your usual trek over uneven paths, rather you walk along man made walkways that hug the cliff edge. Thanks to its uniqueness we recommend that those planning the trip book a few months in advance. Although the total route covers over 200km you don’t have to attempt the whole thing, instead just start and finish wherever your heart desires. This wonderful route passes through 14 towns that run along the coast, including Benalmadena and the MAC Puerto Marina Hotel. Starting from the Balcon de Europe in Nerja and finishing at the Castle of the Duchess of Manilva, you will pass through a wide range of terrain, from beaches and cliffs to boardwalks and towns. So when looking for things to do in Benalmadena, why not pack a rucksack, include a picnic and discover the coastline of Malaga on foot. Hiking in Benalmadena is something recommended before July and August bring the sweltering heat and Calamorro Mountain is a great place to start. To get to Calamorro Mountain walkers can either follow one of the many routes from Benalmadena or Torremolinos, although beware that the incline can make these not the easiest of walks. Alternatively enjoy the excitement of taking the cable car to the summit and enjoy the panoramic views. Once here you will find all the services you need before you embark on your route across this mountain, which stands 800 metres above sea level. This fairly easy walk can be done within an hour and half, with or without a guide and the incredible viewpoints alone make it all worthwhile.